Ri'Kun trembled in fear as he watched Smo'dis, the fearsome mojoka, begin showering himself with energy bolts. It seemed the old orc had finally snapped, and Ri'Kun didn't want to be around to take any stray blasts. Still, he couldn't bring himself to turn away and run. Smo continued to run around in circles, firing energy bolts at his own skull. Finally, Ri'Kun gathered the nerve to step in and take charge. Smo had been a Surjin for a long time; now it was his turn to be the patient. He jumped onto the old mojoka's back, pinned his arms with one arm, and began to bandage his skull with the other. "BUG. . . ark. . . " Smo sputtered as his senses slowly came back to him. 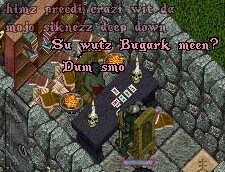 He collapsed into a sitting position on the floor, looking about him dazedly as other orcs mocked him, shouting, "Bugark! Bugark!" "Da hek latz all blahin abowt? Wut am Bugark?" he shouted. 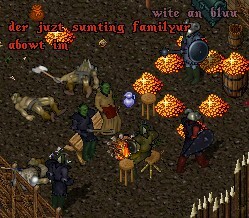 But none of the orcs wanted to spoil the fun, and so none of them said anything. 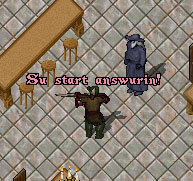 Ri'Kun was too lost in thought to notice the question. "Bugark. . . " he mumbled to himself. "Wut am Bugark. . . "
"BUGARK!!" Smo shouted as he began pelting himself with mojo again, this time with fireballs. Ri'Kun walked up to him, observing carefully. "Lat am tryun tu klomp latzelb," he finally concluded. Once again, he stopped Smo from casting and began to apply bandages; once again, the mojoka calmed down; once again, the gruntees mocked him. Finally, Smo shouted, "DA HEK LATZ DUIN? BUGARK, BUGARK, BUGARK!! LATZ ALL KRAYZEE, GET ME OWT UB HEER!!" and ran for the back door. The gruntees would not have caught up to Smo, who was surprisingly quick for his age, had he not run face-first into a rock and fallen down. Huffing and wheezing, the pack caught up with the dazed mojoka, and Ri'Kun joked, "Lat am eetin tuu much chiggun!" Smo looked around fearfully and murmured, "Huw me get owt heer?" Ri'Kun wondred exactly how Smo did get out there. Not so much the physical act of charging out of the fort, but what made him do it in the first place. Something strange was going on, and he was determined to find out what it was before Smo went crazy. . . or worse. "Littul kuzin. . . am me uki?" Smo asked, eyes wide with fear. "Yub, yub," Ri'Kun nodded. He didn't know what else to do. He only knew he had to do something. "Wut id meen?" Ri'Kun asked the small figure standing in front of him, perched comfortably on a barstool. "Wot ot meen? Wot doez ot meen?" the goblin bartender jeered. "Me talk yoo wot it meen! Ot meen dat yoo not soyong dot word cooroktli!" Che'gal turned his back to Ri'Kun, and served another round to his "hosts" who had flocked to this tavern in the underdark. The tavern, a popular watering hole among many demihuman species, was chiefly goblin ran. The goblins were brilliant alchemists; none could deny that. In a pinch, however, should something break out at the bar...they were more than capable of dealing with that in a most diabolical fashion. "Uki, den huw SHULD me blah id?" Ri'Kun asked rather impatiently. "FLOP YOO ORMS OWT OND YOLL IT!" Che'gal proclaimed enthusiastically. "BOOOO-GOOOORKKK, BOOOO--"
Ri'Kun promptly(and rather predictably) pulled out his heavy crossbow; as he aimed it at the goblin he felt a dozen goblin-crafted upon his own backside. "POT DOT TING DOWN!" Che'gal said in a rather annoyed mood. As Ri'Kun set his own back in the holster the goblin quickly added, "DOT ORK NOB TOLK WORD ME KNOW!" Grinning he added, "YOO ON YOOR OWN!" 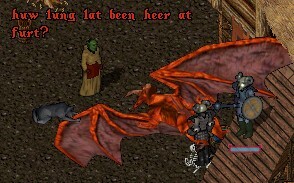 Shrieks and laughs filled the bar; one goblin even blew himself away with the improper care of an unstable concoction. Smo'dis screamed and began to cast on himself again as his cousin Laz'tarul and Laz's son Ri'Kun rushed over to him. "Nub agin!" Ri'Kun muttered as he began to heal the crazed mojoka. Unusually, Smo did not return to his senses right away, but began to look around him nervously and run off into the woods, violently banging his knee on a rock in the process. It had not been very long since Smo had managed to reverse the effects of the mojo accident that turned his leg to stone, and the leg was still very tender. Nonetheless, in his craze, Smo did not even feel the pain as he hobbled off into the woods. Laz and Ri'Kun gained on the fleeing orc, finally catching up as he ran face-first into a tree. Smo came to his senses, looked around fearfully, and mumbled, "Sumting nub rite heer. . . me hab tu get owt ub heer befur me gu krayzee!" Laz tried to stop him, but he mumbled "Rel Por" and vanished into a puff of smoke. The pair searched all over but could not find him. Dejected, Ri'Kun turned to his father. He figured that if they could not find Smo, at least he could ask some questions. "Laz, huw lung hab lat grukd Smo?" he asked. "Mi hule life," Laz replied. "Smo am me uldezt kuzin! 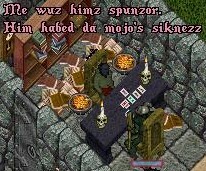 Mojo runz in owr famuli, lat gruk. Smo, F'ru, agh me!" "Hurm. . . Laz, wud lat habbun tu gruk wut Bugark meenz?" Ri'Kun asked. "Bugark. . . Bugark. . . nub, nebur heerd ub it," Laz replied. "Whi lat tink Smo am blahin it agh mojoin imselb in da hed?" Ri'Kun recalled a moment, some time ago, when he witnessed a horrifying change in Smo's demeanor. His old cousin had cracked his head open on a rock, and when Ri'Kun went to bandage it up, instead of bone and brains he saw a giant eyeball staring back at him. Terrified, Ri'Kun ran off. He learned soon afterward of Dhazver, the gazer lord who relied on Smo's body to live and restored his rational thought in return. Nonetheless, the sight of the eyeball which seemed to stare straight into his soul terrified him. And Smo certainly wasn't acting sane now. "Me tink id's da gazur!" Ri'Kun shouted, trying to convince both himself and his father that Dhazver was the source of the problem. "Da gazur? Da ash in imz hed?" Laz asked. "It kumin frum neer da Surjin hut!" Ri'Kun shouted, and the pair took off in pursuit, bursting through the door of the Surjin hut just in time to see Smo flee up the rope ladder. When they reached the second floor, he was nowhere to be seen. "Juzt mizzd im," Ri'Kun muttered. "Wait ash minut. . . me hab ideer!" Laz shouted. "Wut am it?" Ri'Kun asked, excited. 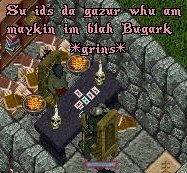 "Ib da gazur am da problum," Laz stated, "den uz juzt hab tu clomp da gazur agh Smo will be uki agin!" 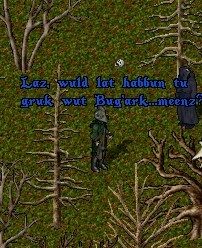 "Bubhosh, but huw uz du dat?" Ri'Kun asked. Sooner than he could say Dhazver, Ri'Kun found himself at the entrance to dungeon Covetous. "Remembur, Ri'Kun, uz hab tu clomp tuff gazur, nub juzt ani gazur. Im hab tu be tuff su da mojowatur am bubhosh powurful," Laz said. "Yub, yub!" Ri'Kun ran ahead to find one, and soon ran screaming back to his father with an angry elder gazer following him. Together, the two orcs had little trouble taking down the elder gazer. Excited, Ri'Kun started to shout, "Ged imz eyestalkz! Agh centrul eyebull!" Having achieved the main ingredient, the pair returned to the keep to mix a potion that would kill Dhazver. "Add da gazur partz," Laz said, "agh me gu grind ub sum niteweed." 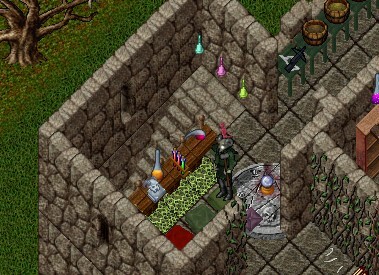 Neither Laz nor Ri'Kun were professional grinders, and pretty soon, they produced a potion which looked as if its ingredients were dropped on the ground and stepped on trather than ground with a mortar and pestle. "Der, it finizhd!" Laz shouted triumphantly. "Nuw all uz hab tu du am get Smo tu dwinkee dis agh Dhazver am clompd!" "Popo, lat shur dis am guin wurk? Me meen, it nub guin clomp Smo insted ub Dhazver, am it?" Ri'Kun asked. Laz looked into the bottle at the mess inside. "Nub shur, Ri'Kun. Uz juzt guin hab tu hupe fur da bezt." "Skahin HEK, Ri'Kun, it been WEEKZ agh Smo nub wakee ub! Wut lat put in dat ting?" 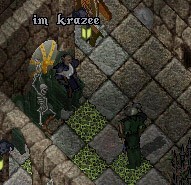 Laz'tarul shouted. "ME?? LAT did juzt az much az me did, nub furget dat!" Ri'Kun shouted back. "Luuk, arguin nub guin get uz aniwer. Uz juzt guin neeb figur owt how tu makr it nub luuk likr uz did aniting!" Laz began to sweat. He was unaware that Smo had stumbled out of his slumber a number of times, only to become violently ill and relapse into his coma. "Agh uz nebur figurd owt wut Bugark wuz," Ri'kun muttered. "Ri'Kun, Smo wuz guin krazi. Der am probubli nub such ting az Bugark. But mebbi uz kan find owt whi im went krazi." "Me hab idea!" Ri'Kun shouted. "Mebbi der sumting in dis buuk dat Smo had wen im drinkeed da tokshun!" "Buuk?? Whi lat nub blah me abowt dis befur??" Laz shouted. Laz sighed, then opened the book and began reading. "'Findin Grobba.' Hurm, it abowt Grobba." "Du it blah aniting abowt Bugark in der?" Ri'Kun asked. "Shaddab agh let me reed it," Laz hissed. 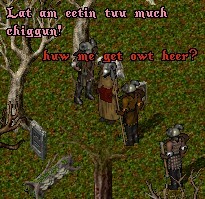 "'Mani muunz agu, me had tu blah gug'ye tu Grobba. It wuz beri sad bekuz Grobba'z hume wuz takun obur bi nubhosh monzturz leed'd bi sum mowzi ash kalld Barakuun ur sumting. Dem blahd all da shiggunz wuz gune, but me nub beleeb dem! Grobba am bubhosh smart, agh me tink im ezkaped sumwer. 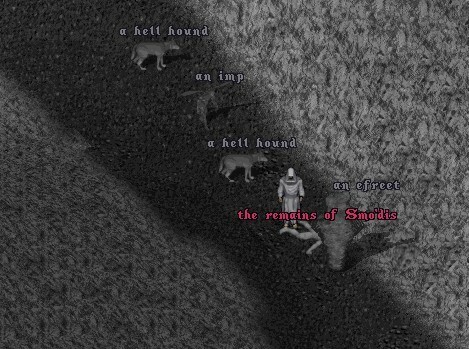 . . '"
Smo'dis wandered the strange land of Ilshenar, guided by nothing more than a feeling that Grobba was still alive. If the monsters came from Ilshenar to Grobba's home, perhaps the ostards had hopped their gates to Ilshenar. However, luck was not with him. Not to be daunted by a single death at the hands of an efreet, Smo returned from the Wargod's chamber to a strange shrine and tried again. 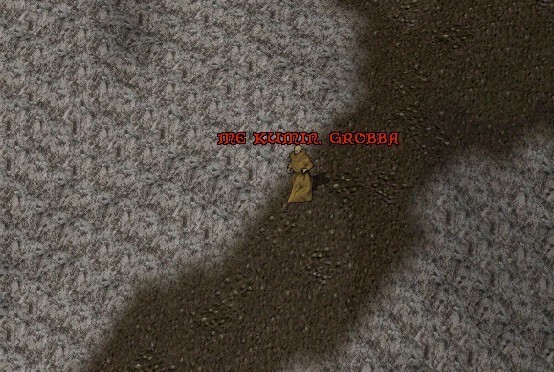 Realizing that he would not be able to save Grobba alone, he enlisted the help of the animal-friendly Gorgok and a group of bored orcs. But fate was not through attempting to foil Smo's attempts to save Grobba. Apparently a nearby human had observed Smo's plight and set a trap for him! Luckily, Smo was too smart to fall for the humie's trap. Obviously, the ostard was a spy, trained by humans to observe the orcs and find their weaknesses, paving the way for a humie attack! 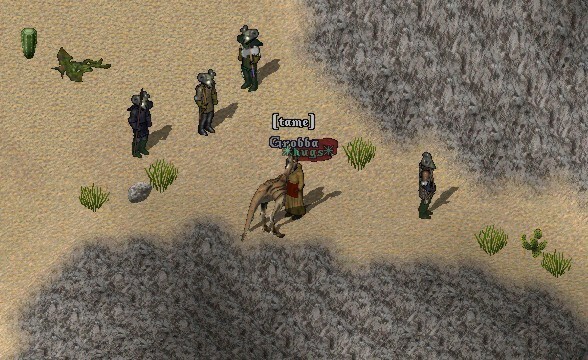 After quickly dispatching the false Grobba, the group traveled into the dangerous deserts of Ilshenar. "GROBBA!" Smo shouted, and after several unanswered calls, he heard a faint cry. "GROBBA!!" he yelled again, and again, an ostard call answered him. "GROBBA!!!" Smo yelled happily, as his friend came running from over a sand dune. "HOOWAH GROBBA!!" Laz cheered. "Bubhosh endin tu sturi!" "But popo," Ri'Kun interjected, "me nebur meetd Grobba. Wut habbund tu im? Agh der nubting in dat buuk abowt wut Bugark am?" "Nub, buuk endz heer," Laz sighed. "Skah!" Ri'Kun growled. "Now how am uz guin find owt wut habbund tu Grobba?" "Wouldn't you like to know, Ri'Kun?" a strange voice behind the pair asked. "WUT DA HEK??" Ri'Kun and Laz spun around at the same time, eyes wide with shock. There sat a mysterious yellow-clad figure, sitting on top of an ostard which looked remarkably like Grobba. "Wh-whu am lat? How du lat gruk whu me am?" Ri'Kun stuttered. 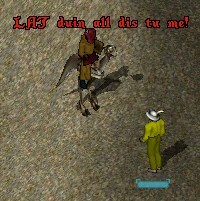 "Agh," Laz growled, "whi lat ridin mi kuzin'z shiggun?" Angrily, he advanced towards the strange man, preparing a spell. The man looked at the furious Laz and laughed a hollow, empty laugh. "I wouldn't do that if I were you, Laz'tarul. I really wouldn't." The two stared each other down, and Ri'Kun hid behind a barrel, not wanting to be caught in the middle of the battle which seemed imminent. 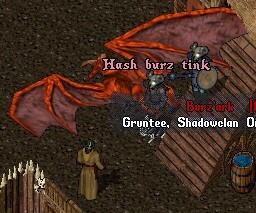 "Me guin azk lat ASH time," Laz'tarul growled at the strange pointy-eared humie. "Whi am lat ridin Grobba?" "I've come to bring him home, Laz, to bring him home I've come," he replied. "I too am a friend of your cousin's, a friend indeed! I am Elinidar, dark elf of the Malas underground, leader of the Dark Horde of Malas." "Gah, it am krazi puinti-eerz," Ri'Kun muttered under his breath. "We've watched you for quite some time, watched you carefully we have," Elinidar said. "Me nub gruk," Laz muttered. "Wut am lat agh huw du lat gruk mi kuzin, agh whi duz Grobba truzt lat enuff tu let lat ride im?" "It's a long story, Laz, but let me explain. I will explain the long story. . . "
"GAH, me sinkin in mud!" Smo'dis shouted as he struggled to pull himself and his friend Grobba out of the mud puddle. Nobody paid much attention to the mojoka. He and his ostard were falling in mud puddles all the time, and everyone expected him to crawl out sooner or later, dripping in mud. However, this time Smo kept sinking in, until he and Grobba vanished from sight. A panicked gruntee ran to the puddle and started digging, but it was no use. The mud was too tough to dig through. One loud pop later, Smo found himself in a large underground cavern, with mud dripping on his head. He wiped himself and Grobba off and looked around. "Da hek?" he muttered. "Smo'dis! Welcome to my home!" a voice boomed from ahead of him. He raced forward to the source of the voice, and made out the figure of a yellow-clad elf waving to him in the darkness. "Remember me? 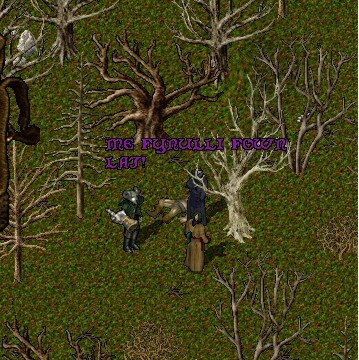 Of course you do, that's my spellbook you're using!" he shouted as Grobba trotted up to him. "Dhazver, good to see you again. After I'd heard that you were defeated by the humans and imprisoned in another facet, I'd thought we lost you forever." "Elinidar," Dhazver acknowledged using Smo's mouth. "I hate that other facet, it does something to my brain. Grobba!" Elinidar shouted. "Welcome home!" Grobba tossed Smo to the ground, trotted next to the elf, squawked and nodded his head. "Hume. . . ?" Smo murmured as he sat up, dazed from falling off of Grobba. "Yes, Smo. Grobba is a member of the Dark Horde, an assistant of mine. 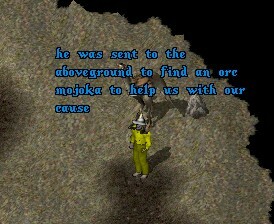 He was sent to the aboveground to find an orc mojoka to help us with our cause." "We watched as the mojoka came to find ostards, but none of them were suitable to help us. Then we learned of you, and we knew that you would be the one we needed." Grobba trotted back to Smo, and the orc climbed up. Elinidar walked up to him. "Whi lat neeb me?" Smo asked. "It's a long story, Smo. About time you got here. Do you know how many mud puddles we had to make in your facet to finally get you to the underground portal?" "Mud puddlez. . . su LAT duin all dis tu me!" Smo growled. "Smo, we've called you here because we need your help. For many weeks we've fought with the gargoyles and humans of the underground of Malas. At last the time has come to attack their fortress, but there's one small problem." "Whi shud me helb lat?" Smo asked. "Because, Smo, we helped you," Elinidar said. "I gave you the gift of magic, Grobba gave you his friendship and his speed in battle, and Dhazver gave you sanity. We've worked very hard to shape you for this battle, because you are our only hope." 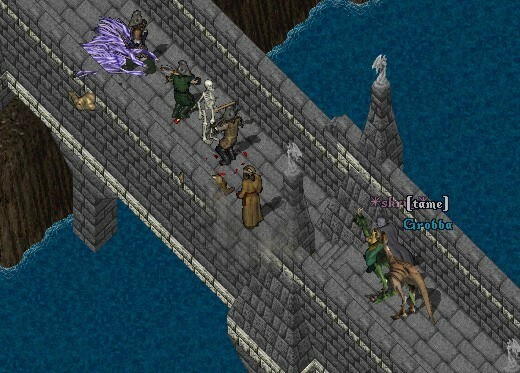 "The leader of their army is Urzil, a gargoyle from Ilshenar. His pet swamp dragon is completely invulnerable to physical attacks, and since the defeat of Dhazver, none of us are able to use magic," Elinidar explained. "Lat neeb me tu clomp sum dum fuud-lizzi? Dat nub problum," Smo grinned. "Smo, this is no ordinary swamp dragon. Not only is he sompletely invulnerable to physical attacks, but he is extremely resistant to magic. Your mojo may be strong, but this swamp dragon is as strong as a real dragon." "Still, it am juzt lizzi. Dat meen uz guin clomp it, nub problum," Smo stated. "So," Elinidar asked, "You've decided to help us?" Smo's eyes narrowed. "Letz gu." Battle raged through the underground fortress of Urzil, the leader of the Virtue Army of Malas. Elinidar's army of orcs, dark elves, and trolls fought bravely against the humans and gargoyles of the Virtue Army, and many were slain on both sides. Smo'dis rode throughout the battlefield, casting healing spells on the Dark Horde's fighters and helping to turn the tide of battle. Hard as the Virtue Army fought, the stronger tactics of the Dark Horde combined with Smo's healing abilities won out, and the Horde soon found itself at Urzil's chamber. Smo and Grobba charged in, followed closely by Elinidar and a half-dozen of the decimated but victorious Dark Horde. Urzil stood, ready for combat, his pet swamp dragon at his side. He glared at Smo. 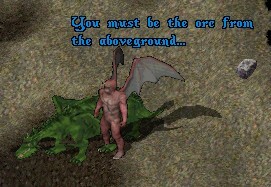 "You must be the orc from the aboveground. . . " he growled. "It's over, Urzil. You cannot stop us. Soon we will end your so-called Virtue Era and bring forth the era of OUR rule, the Age of Shadows!" Elinidar shouted. Urzil ignored the dark elf, eyes locked with Smo's. "You know magic, but you are still just an orc. I'll take care of you myself." He then glanced at Elinidar and the Horde. "As for you. . . my pet here should be more than a match for you!" The swamp dragon charged into the crowd, quickly mauling a Horde orc, but Smo had experience with dragons. Ignoring the charging Urzil, he quickly paralyzed the swamp dragon, and instinctively yelled out, "CLOMP DA TAMUR!!" The Horde reacted quickly to Smo's scream, and as Smo took the full force of Urzil's magical assault, the warriors quickly surrounded the gargoyle. They struck over and over and over, giving Urzil no chance to cast another spell, and he soon fell to the Horde's might. The infuriated swamp dragon shook off the magic paralysis quicker than anything Smo had seen and attacked again, dropping the mojoka. The startled warriors stood around, staring at the swamp dragon nervously, but without his master to command him it made no move. Smo returned to the living world in the middle of a forest, naked and without his friend Grobba. "Da hek. . . wuz it all juzt sum dreem?" he mumbled as he rubbed his aching head. He reached into his pack to pull out his magical robe, and found an apron in his pack as well. On the back of the apron were words that he read aloud to himself as he wondered about where it came from. 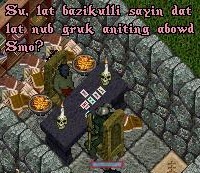 "Tu Smo'dis, fur helbin tu ushur in da Aje ub Shaduwz. . . ?" he read. "Grobba, wer am lat. . . " Smo thought aloud, staring up at the sky. "Su Grobba staid wif lat abtur latz beet dat garguil?" Laz asked. "That's right, Laz'tarul, that's right!" Elinidar replied. "But he wants to return, return here. His friendship with your cousin is strong, strong it is! Let me see him!" "Smo sik rite nuw," Laz said. "Nub kan see im, im neeb tu rezt." "Then I guess I'll have to come back later, come back later I will. I can't stay in this facet for long, no I can't," the elf stated. Ri'Kun, who had almost dozed off during the story, blinked sleepily. "Me juzt hab ash qweshchun befur lat leeb," he said. "Lat gruk wut Bugark am?" "Bugark, Bugark, you ask me what Bugark is! I know, Ri'Kun, indeed I know, but it's not my place to tell, no it isn't. But you'll learn soon enough, Ri'Kun, yes you will! Hee hee ha ha ha!!" 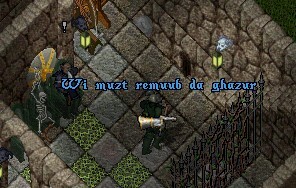 "Uz neeb tu gruk NUW!" Ri'Kun shouted, but the elf vanished as quickly as he appeared, taking Grobba with him. 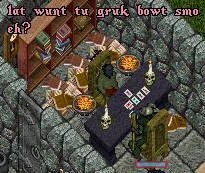 "Lat wunt tu gruk bowt Smo eh?" the aged mojoka murmured after Ri'Kun had handed him a hefty amount of weeds. Ri'Kun nodded. "Me wunt tu gruk whi im su weerd! Ebun fur mojo! Whi im hab dum ghazur, agh dum chiggun, agh akt awl dum?!" "O yub," Fogroth nodded. "Cuz him wuz oomie... at leezt me gruk su." "WUT?!?" the new grunt gasped in shock. "Dat impozzibul... unreel!" The explanation of Smo's origins seemed to go past Ri'Kun's head, so Fogroth decided to change the topic. "Me remebur wen him wuz juzt ash kubbie. Me wuz himz spunzor. Him hab'd da mojo'z siknezz." "Mojo... siknezz?" Ri'Kun asked curiously. "Yub, him nub kud be neer mojo witowt sneezin agh throwin up himz cidur. Me uze tu mojo him ull da tyme. Id wuz funni!" Ri'Kun thought for a moment about this statement, then replied, "So whi im abul tu be mojoka?" Fogroth was puzzled for a moment as he tried to remember what he knew about his tribemate. "Urm... yub, him wuz guin crazi - muur su den muzt mojokii. Him wuz sik ub himselb! Me remebur dat him nub cud ebun speekur. Him cud unli blah ash wurd... Grobba." Ri'Kun sat quietly as Fogroth finished his tale. "Dat whi Smo wuz su crazi, till him gut cuntrul ub it agh finalli blahd muur wurdz den himz dum shiggun name." "Ib im am en su kuntrul ub id, whi im neeb ghazur agh Grobba?" Ri'Kun asked. "Smo juzt relies un sum dumash inside him tu keep himz mojo under control. Nub shur wut da ting am... mebbi it am gazur," Fogroth replied. "Su datz wut da gazur am," Ri'Kun murmured. "Su idz da gazur whu am maykin im blah Bugark." "Nub!" the mojoka argued. "Dat da uld Smo tryin tu git owt. Yub... "
Ri'Kun grinned. Progress! "Me see," he nodded. "Yub, himz preedi crazi wit da mojo siknezz deep down, har. Dum Smo." 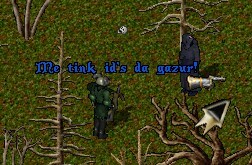 Ri'Kun resisted the urge to reply with "All mojoz am krazi" since this was his chance to learn what Bugark was. "Su wutz Bugark meen?" he asked. "Uhh... " Fogroth hesitated. "Id da sound shigguns makur? Bagak!!" Ri'Kun groaned. So the old mojoka was as crazy as a humie in the fort after all. Fogroth continued. "Nub shur halb da tingis bowt Smo animuur, him preedi weerd likur lat blah'd. Me juzt remebur him wuz mojo sik agh me lubbed tu taunt him bowt id bi ghaashin him." "Su," the young Zerker interrupted, "Lat bazikulli sayin dat lat nub gruk aniting abowd Smo?" Fogroth snickered. "Uh, nub mutj, lat shud blah wit im ib lat lub him su mutj. Har har har!! Dum Zerkerz!" Ri'Kun grumbled at the waste of his time that the interview had turned out to be. Rulg fur nuffin, mojo," he grumbled as he turned and walked out of the mojo hut. "Har, dumhed," Fogroth snickered as he watched Ri'Kun leave. He knew the young grunt wouldn't believe what he said. It didn't matter to him though; after all, Smo wasn't his problem. "Im nub bin rite sinze ting gut pud in brayn." "Im habbun problemz laytli... me fink mojo allerji guin tu klomp im," Ri'Kun suggested. Girm seemed not to hear him. "Nub shud hab nuffin but latz own brayn in skuul," he continued. Ri'Kun liked this suggestion. "Mebbi... id shuld be remuubed... " he offered. Girm readily agreed, and the Zerker continued, "Wi muzt remuub da ghazur!" "Problee klomp im," Girm pointed out. "Yub, idz truu, but idz beddur den im turnin bak entu oomie, iznd id?" Ri'Kun asked. "Pah, im juz turn intu jibburin jabburin glob," the Walker stated. "Im problee pud ghayzur in hed kuz im nub konfidint. Im wuz weerd aniwey, bud wen lozt Ruse tu Girm im nub wuz saym." Ri'Kun sighed. He didn't see what some dumb fe-orc had to do with Smo going crazy and putting a gazer into his head. He tried to return to the subject. "Im needud tu kuntrul imz mojo allerji," he said. "Smo nub wuz allurgik tu mojo," Girm replied. 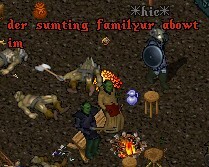 Ri'Kun stood, stunned and confused at this statement, as the older orc continued. "Id am syko-soh-madik. Him lurn mojo tu tri agh konkur id! Soh im nub hab be skarid ub id. Ob KORZE im pud bawl ub krap in imz hed!!" Ri'Kun had just begun tu show interest as Girm continued. "Me agh Smo wuz ribulz bak wen kubbiez. Him wuz dum fathed'd luskr. Im onlee klomp'd me ash tyme, bud im cheetid, agh Girm wuz tu nyce tu da pansee." 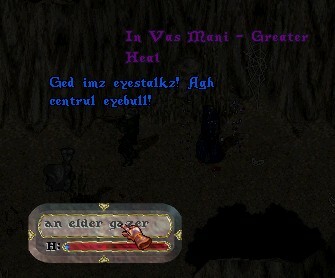 Ri'Kun's dropping head eventually brought his eyes to Girm's lusk, as he realized the irony of the last statement about "dum fathed'd luskrz." Girm's eyes caught his, and he followed the gaze to his lusk. He grumbled. "Pud MUNKEE ON TOP!!" he shouted, for no apparent reason that Ri'Kun could think of. Ri, who was now quite convinced that Smo'dis wasn't the only crazy orc he'd been dealing with lately, again tried to return to the topic of the gazer. "En da wuudz... Me will teyk kayr ub id. Me will mayk shuur ub id." Girm looked at Ri'Kun with angry eyes, the eyes that showed that he wasn't going to let anyone else clomp HIS rival. "Lat moor ub de organ donur type... " he murmured. "Nub klomp Smo!" Girm shouted as he attacked Ri'Kun. "LAT NUB GUIN TU STOB ME!!" Ri'Kun yelled as he ran out of the hut, bleeding and coughing. Smo'dis stared intently at the gruntee by the ramp. He felt a strange sort of familiarity with the gruntee, though he couldn't explain what it was. It was eerie, in a sense. Burz'ark fidgeted nervously under Smo's scrutiny. He'd heard tales of Ri'Kun, the missing grunt, and was terrified of meeting the same fate. Rumor had it that Ri'Kun was last seen by Girm'luhk the Shadowwalker, as he set out to slay Dhazver, the gazer inhabiting Smo's head. He was never seen again. Since that day, Smo was different. He was calmer, more in control of himself. And he stopped shouting the strange word that nobody ever managed to remember in the telling of the story. Burz just knew that it had something to do with bothering a magruka, or something. Nobody asked Smo what happened; nobody wanted to meet the same fate. "Huw lung lat been heer at furt?" Smo asked, rousing Burz from his memories. "Dis muun, ur fur mi life?" the gruntee questioned. "Latz life. Huw mani cykulz lat been alibe?" Smo replied. Burz's breathing quickened. Sometimes grunts asked gruntees how long they'd been alive in preparation for sponsoring them! "Hash, Burz tink," he hastily replied. "Gah, dat all? Lat luuk familyur tu me," Smo muttered. Burz stood at attention, unsure of what to say. He didn't know if saying that he didn't know why would upset the mojoka, and he didn't know if lying about it would lead to more questions he couldn't answer. Would Smo get angry with him for saying he didn't know what the old mojoka was talking about? "Gah," Smo muttered. "Gu get me turnib." "Yub sur!" Burz shouted as he ran off to do what he was told, thankful to escape the tense situation he was caught in. Smo settled down by the fire with some other grunts. "Ey latz," he asked, "Latz gruk dat Burz'ark runtee?" He received mixed replies from the Kuul Gorknok and the Walker Waagajub. "Der sumting familyur abowt im," Smo mused. "Huw su?" Dum'Lug the Durbat Ashu asked. "Yub, likr wut?" Waag added. "Nub shur," Smo muttered. "Im luuk familyur doh... likee me grukd im befur." "Yub, im luuk likee Arc," someone mentioned. But Smo shook his head. "Nub... im luuk kind ub likee F'ru tu me, nuw dat me tink abowt it," Smo pondered. This statement led to a round of reminiscing from the other grunts. "Gah, me mizz F'ru," Waag fretted. Gorgok the Blakfizt, who had been listening to the conversation, offered Smo a bit of useful information. "Eh, F'ru stik out more dan dat," he claimed. Smo nodded. "Yub... der juzt sumting familyur abowt im." He stared dumbly into the campfire, the image of the gruntee Burz'ark burned into his memory. Why did he remember this gruntee so vividly? And why was it so important? But as much as he tried to recall, it didn't come to him that night. Smo'dis fidgeted restlessly in his sleep. He saw the slaughter of a tribe of orcs - orcs like the Shadowclan, like himself. The humies were ruthless and efficient, slaughtering the adults and capturing the children to be sold as guinea pigs to curious mages. Worse yet, Smo was part of the dream - he was a cub, being hauled off as an older fe-orc tried desperately to fight through the armored humies and save him. Just moments before, she had been inside their small hut, trying to hide him and another, much smaller cub. She'd managed to hide the smaller one, but the humies had broken in before she could save Smo. Just before the humies pulled the sack over his small body and threw him into the gate cast by one of the party's mages, he saw the older fe-orc, bleeding from her wounds, turn and give one last look to the hut which lay in ruins. "Burz... " she whispered, and then collapsed. Smo'dis awoke inside the Grunt Hut of the fort, sweating. He looked nervously around the fort, as if to reassure himself that he was there. The fort looked strangely bare. He looked with weary eyes at the speaker. It was Pigulg, his tribemate and the Shadowclan Wargoth. But instead of his bronze cape, Piggi wore one colored in Hukor green. "Dat am weerd," Smo thought to himself. "Piggi alwaiz warez da Surjin bronze kape." "Get ub alredi!" Pigulg said. 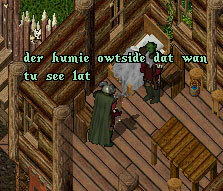 "Der humie owtside dat wan tu see lat. Im gabe bubhosh tribuut fur uz tu wakee lat ub!" Smo nodded, and called for Grobba. There was no answer. Smo stared at Pigulg as if he'd suddenly grown an extra head. 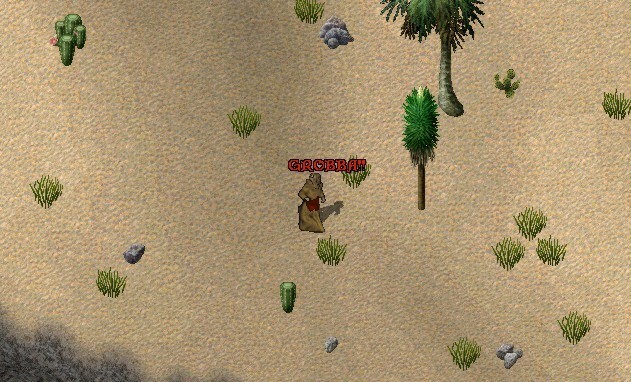 "Lat gruk whu Grobba am," he muttered, pointing an accusing finger at his tribemate. But as suddenly as he'd acted, he reacted, when he noticed that his hand was clutching an executioner's axe, his weapon of choice during his days as a lusk'r. He looked down at himself and realized he was wearing a full Surjin clomper's uniform, complete with bone arms and fancy shirt. "Lat uki?" Pigulg asked. Smo nodded dumbly. "Guud, den get owt der agh gu see wut dat humie wantz!" Confused, Smo walked out the front entrance of the fort. He was shocked that all the trees had leaves. But he almost dropped the axe when he saw the humie who had awakened him. Standing before him was the old mage Asmodeus, who had once cast a spell that turn himself into an orc - the same orc, in fact, who stood in the fort doorway now. "Good morning, Smo... no, that's my name. I should probably call you by your real name, shouldn't I... Bugark?" Smo looked up at the humie, suddenly fully alert. "Me nub gruk wut guin un, ur how lat am standin der, ur wer Grobba am... me beri kranki rite now, agh me wan sum ansurz." "Come with me, and I'll explain everything," the mage promised. "Ash minut... " Smo muttered. He walked back into the fort, where Pigulg waited. "Piggi... whu am me?" "Lat shur lat uki, Bug? lat luukin kind ub palee," he responded. "WUT MI NAME, PIGGI??" Smo asked frantically. "BUGARK!! Bugark... lat hab amneezuh ur sumting?" he answered. Smo just shook his head and walked dumbly outside. "Now, Bugark, if you're ready to come with me, I'll be willing to explain everything," Asmodeus stated. Smo, too confused and frustrated to care, nodded dumbly. "Very well. Vas Rel Por!" and the mage opened a moongate, and stepped through. Smo followed, and sneezed when he came out the other side. Smo'dis - Bugark - grumbled as he looked around the room. 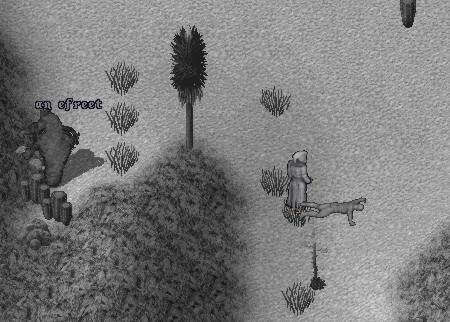 He didn't see any other humies, which was good. He did see a massive collection of books, and some tables. "Lat promized lat wuz guin answur mi qweshchunz. Su start answurin!" he growled. "In due time, orc, in due time. Have a seat." Asmodeus motioned toward one set of tables, and Smo sat down. The mage remained standing, staring at the bookshelves. "I've learned so much here... this library really is an overlooked resource. Nobody comes to Nujel'm anymore." "All right, all right. Where should I begin. I'd just purchased you from the slave caravan, and I was trying yet another spell to reverse the aging process. Another spell that backfired, and the backlash had knocked you out cold." At last the old mage turned away from the books and walked to the other side of the table. Instead of sitting in the chair, he magically created an ostard to sit on. "More comfortable. Like riding Grobba is comfortable to you. You understand," he explained. Asmodeus continued. "I had grown careless, and I was reviewing the words of power while I was mixing reagents. It's the kind of thing you're never supposed to do, because you never know what side effects will occur. But I was so caught up in discovering this new spell that my mind wasn't on what I was doing. "The next thing I knew, there was a massive explosion, and the very fabric of reality began to tear apart. It was something straight out of a horror story, like the scholars at the Lycaeum used to frighten apprentices out of experimenting with magic unsupervised. You, me, the reagents, even the air itself seemed to destabilize. Luckily, one of my other magical creations, a variant on the Dispel Field spell, managed to keep it from tearing our physical bodies apart. But the feedback from the counter-spell ripped open a portal between worlds, and I was sucked in - and most of your memories with me. While my spell protected our physical bodies, our minds jumbled in the disaster." "Agh lat ended ub heer?" Smo asked. "That's right. Right where my house stood on our home world. Only it wasn't my house. I ran outside, and the trees and mountains and some of the houses were all in the same places, but a few of the houses were radically different. Mine included. As it turns out, I have no counterpart in this world." "Dat nub eksplanez whi me heer," Smo grumbled. "Patience, my dear orc, patience. I'm getting to that," the mage assured him. "I'm not sure if it was the fact that all my notes and research were in my house, or if it was just plain old homesickness, but I was suddenly filled with the urge to find a way back home. I headed straight through the Lycaeum, and began reading every book I could find on the properties of magical gates. But I didn't find the answers there, or anywhere else, for that matter. And then I came here. 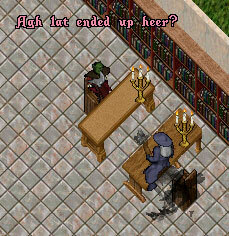 Even this library didn't have the answers I was looking for, but I did learn a lot more about various spells. I soon set to work, trying new experiments, and devised ways to see into our world, and even to temporarily switch the minds of the same creature in two different worlds. The former spell is why I know everything about you since the accident; the latter spell is why you're here. In this world, I never existed, so the accident never occurred. You grew up as Bugark the lusk'r, and you never took up magic, or met Grobba." "Su lat browt me heer," the orc frowned. "Whi? Wut lat wan wif me?" "I've learned much since coming to this world, Bugark. But I've also forgotten much of what I'd already known. Much of that knowledge may have been transferred to you in the accident." "Su... " Smo mumbled. "Me am nub lat... me wuz alwaiz uruk?" The mage nodded. "You thought you were me because you had my memories, and because I was no longer in your world. It seemed logical to assume that my quest for youth had actually succeeded, in some perverted manner... especially since most of your own memories were in my head, and some of mine ended up buried in yours." "Gah... all dis time, me tink'd me wus lat... "
"Time is short, Bugark. Let me get to the point before my spell wears off." The orc nodded. "Rite, rite. Su wut lat wan den?" Asmodeus looked him in the eye. "I've been stuck here for a long time. I want to go home, and from what I've seen of your own experiments, you want to learn how to cast a gate between worlds as well. Find my notes, Bugark. You have the memory of where my house is - go there and read my notes. Memorize them. When you're done, I'll bring you back here and you can relay them to me." "Agh whi shud me helb lat, abtur all lat did tu me?" "Because," the mage said, "first of all, if it wasn't for me, you'd still be dumb as a brick, trying to hit everything you saw with an axe. I think you owe me this favor in exchange. Second, if I can figure out how to make this gate, I'll be willing to share the process with you. 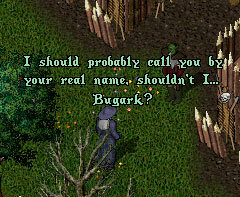 Think about it, Bugark. You'll finally have the mojo you wanted to learn so badly." Smo nodded. "Uki, humie. Ib fur nub uddur reezun den tu gruk dis mojo, me guin helb lat." Asmodeus's face lit up. "That's great! You won't regret the decision." The pair sat in silence for a moment, staring at each other. 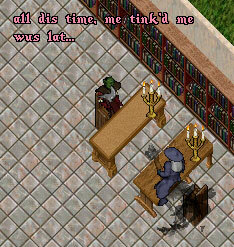 After another brief pause, the orc said, "Wut lat remembur bowt mi momo agh popo?" 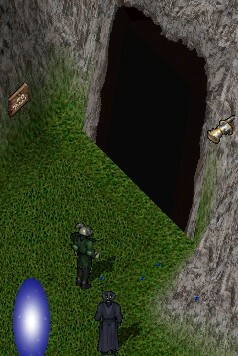 "Well," the mage began, "you were born in a cave not too far from the orc fort. Your parents were both kigg'rs. I'm sure you know by now that F'ru wasn't your biological cousin." The Surjin rubbed his ears. The mage's voice was beginning to grow faint. "Your mother's name was Gur'ark, and... father's name... Qor'gark... lived with a small tribe... baby brother... name was... human raid... captured... "
And everything slowly went dark. Smo'dis stared at the patch of grass where, years ago, the elderly mage Asmodeus had once made his home. Not even a pile of rubble remained - the house was totally gone. There was nothing left of the mage's past, or of the orc's, either. "So, Smo... what are... you going... to do now?" Dhazver asked. The orc shrugged. "Gezz me guin hab tu wate fur dat mojo humie tu kall me bak, agh blah im da nubhosh nuuz," he responded. "I... don't think... that's... going to happen," the gazer replied. "Whi dat?" the orc questioned. "Well... he can... watch you... from his world... he can see... his home... is no more. He... has no more... use for you." "Yub," he agreed. "Me gezz it obur. But it boddurz me, Dhazver. Ebriting me grukd abowt meselb was fake... me wuz nebur humie. 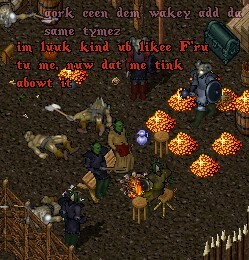 Me gruk demz humie blah, agh me gruk how tu reed agh rite agh ebun du mojo, but dem wuz nub mi grukkinz... dem wuz imz." The mojoka paused to wipe the tiny hairs from his chin. A dead rabbit carcass lay not far from where he had sat down to rest, and he always ate rather messily. Dhazver was silent, unable to find the words to reply. "Me lozt su much agh gaind su much... me wud nebur hab been takun in bi F'ru'z famuli if dat nub habbund, agh nebur been part ub da Mojo Famuli. But me wud nub hab lozt mi REEL bruddur eedur." Dhazver interrupted. "Your brother... Burz'ark?... found his way... to the fort. Did you... really lose him... after all?" The orc sighed. "Me kant blah im dat im am mi bruddur now, kan me? It been su long... agh me leebd im owt der un imz uwn. Me nub ebun gruk how im manajed tu surbibe dis long." "Did... you sponsor him... out of guilt, Smo?" Dhazver asked. "NUB!" he shouted. "Im wuz reddi tu be grunt. Im still ash ub da bettur gruntz me sponzurd. But... me gezz me did owe im sumting... fur nub helbin im bak den." "There was nothing... you could... have done." The strange pair quieted, although to a passing stranger, it would not have been noticeable - the entire conversation was taking place inside the mojoka's head. "Tell me... one thing, orc... do I... call you... Smo'dis now? Or... Bugark?" The orc stretched his arms, stared into the sky, and began to speak out loud. "Me been tinkin lotz abowt dat... heer wut me kame up wif. Bugark wuz luskr... im wuz alurjik tu mojo, agh im juzt kared bowt eetin, sleebin, drinkin cidur, agh clompin humiez. Dat mojo dat Smo wuz bazed un... im WUZ mojo, getz sik frum cidur, agh wuz konstintli triun tu gruk muur, diffrunt mojo. "Blah me sumtin, Dhazver... wich ash am me?" And with those words, Smo'dis the mojoka stood up, thumbed through a rock book, and opened a hole to the Nujel'm library. He had a lot of studying to do.